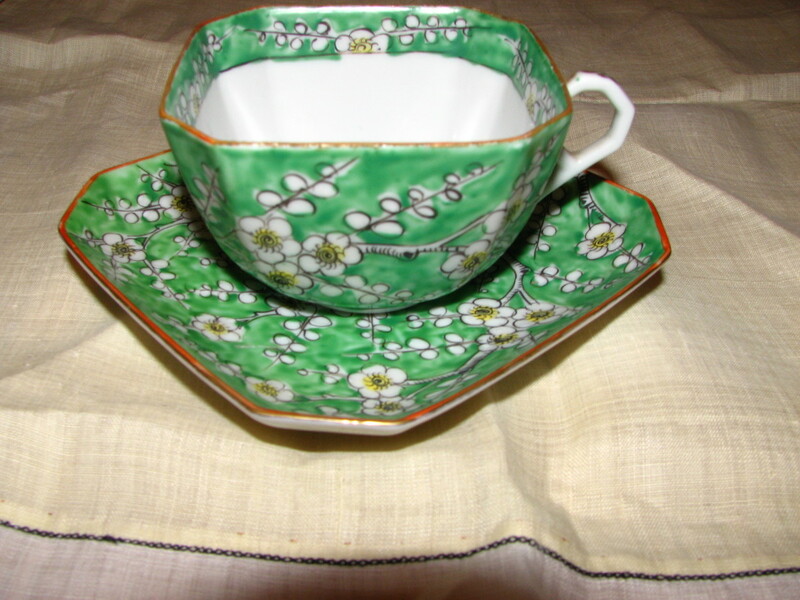 Teacups and beautiful tea sets were once an essential part of any home. 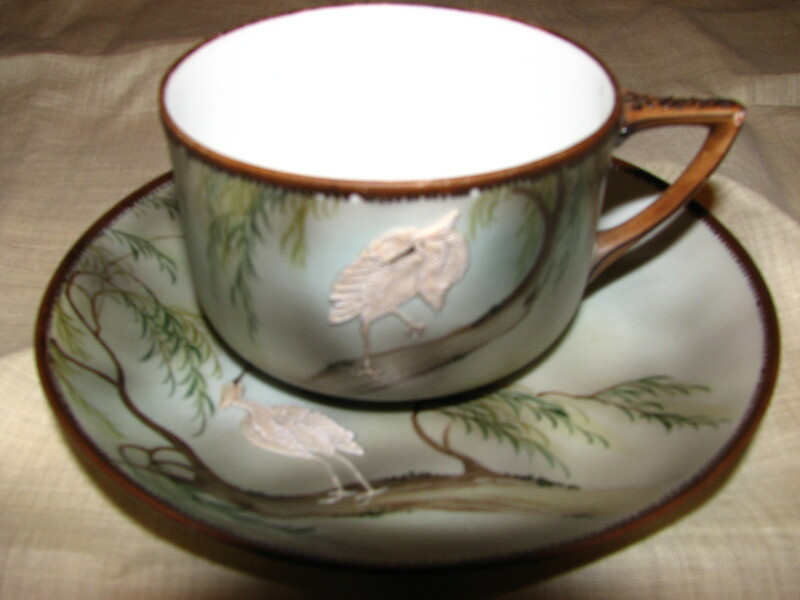 Tea parties were an important expression of hospitality to friends, family and business associates. No housewife could be without her tea set and cup collection. 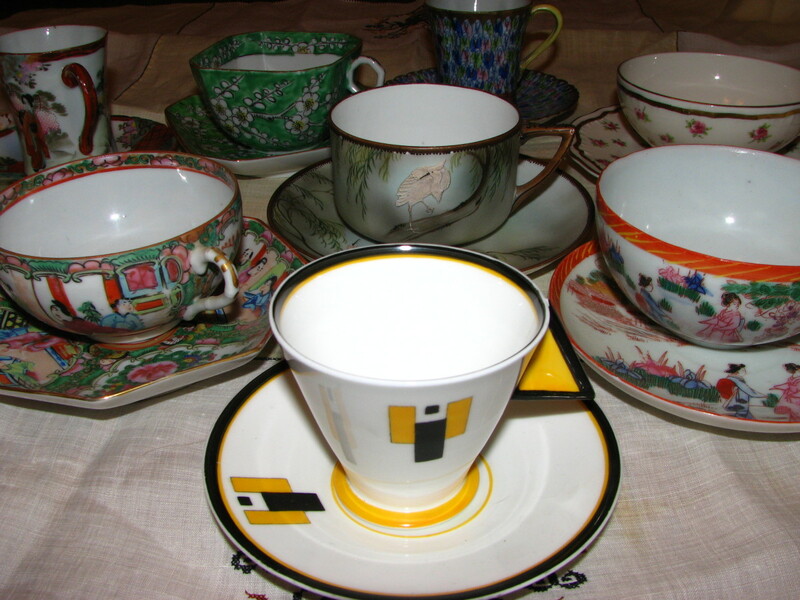 Have you ever wondered why your grandmother had so many different kinds of teacups? All mismatched? I have. I thought that my grandmother was just a collector, but I know better now. Most collections were the result of a quaint tradition: the teacup shower. A few years ago, my brother sent me a box. 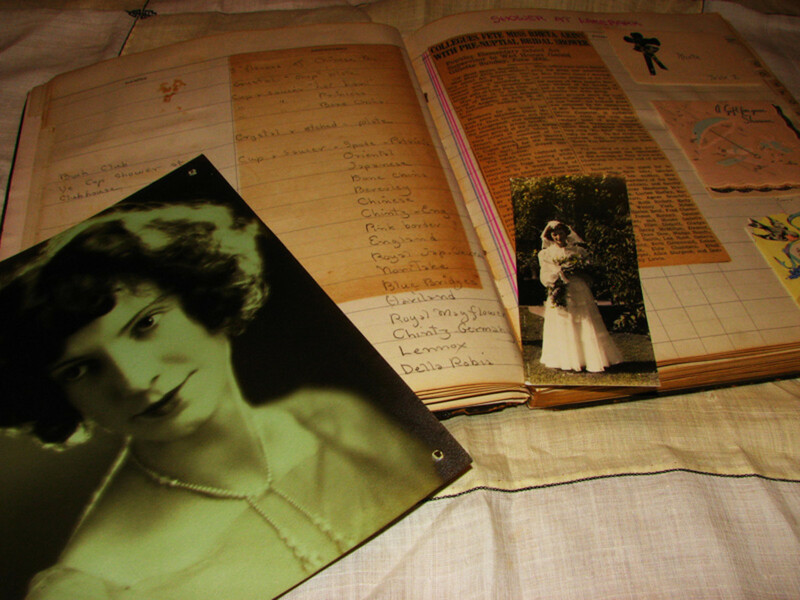 It was filled with things that had belonged to my cousin, Rheta Akins. Born in 1904, she grew up in the end of the Victorian era, and went to college during the roaring 20's. She married Homer Gillette in 1940. She was an artist, teacher, and champion of the arts in Southern California. Tucked away in the box was an old scrapbook entitled, "Wedding Gifts". Inside I found invitations to bridal showers, greeting cards, newspaper clippings and lists of gifts received. 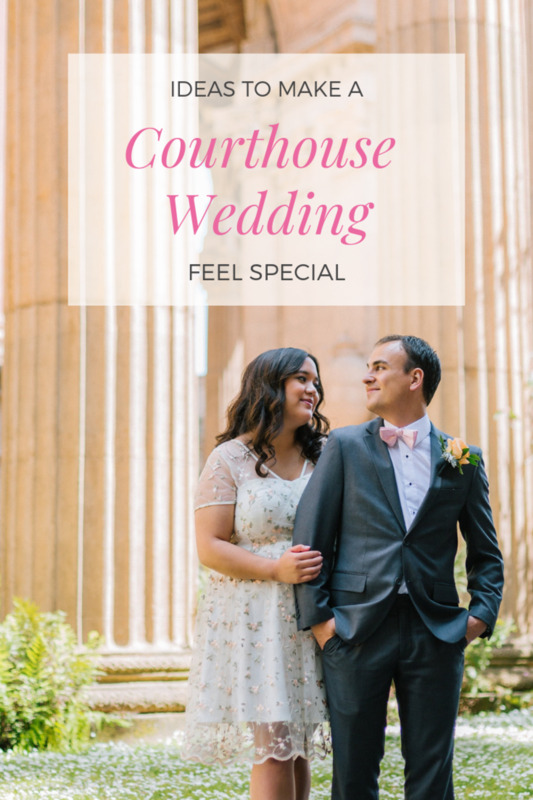 Many different parties were thrown in honor of the new bride, but the one that intrigued me the most was "Ye Old Teacup Shower". There listed, I found SEVENTEEN different kinds of teacups and saucers. It suddenly dawned on me that this was how all these teacup collections must have started. It must be a lost tradition that faded into history along with the practice of giving tea parties. I wasn't at the party, as I hadn't been born yet, but luckily , a newspaper had recorded every detail of the extravagant affair in a clipping I found in the scrapbook...that I now share with you. Princess, I pray, to your friends give heed! Laughter's a thing they say can't be bought. That's ridiculous...not for sale? Indeed! That commodity is found in a silver teapot. - Guests should come formally attired for the elegant occasion. - Tables should be adorned with tablecloths, candelabras with lit candles, plentiful flowers and greenery, in garlands and centerpieces. The tables are laden with finger sandwiches and dainty treats of all sorts. Tea is served at each end of the table by the hostesses or friends. 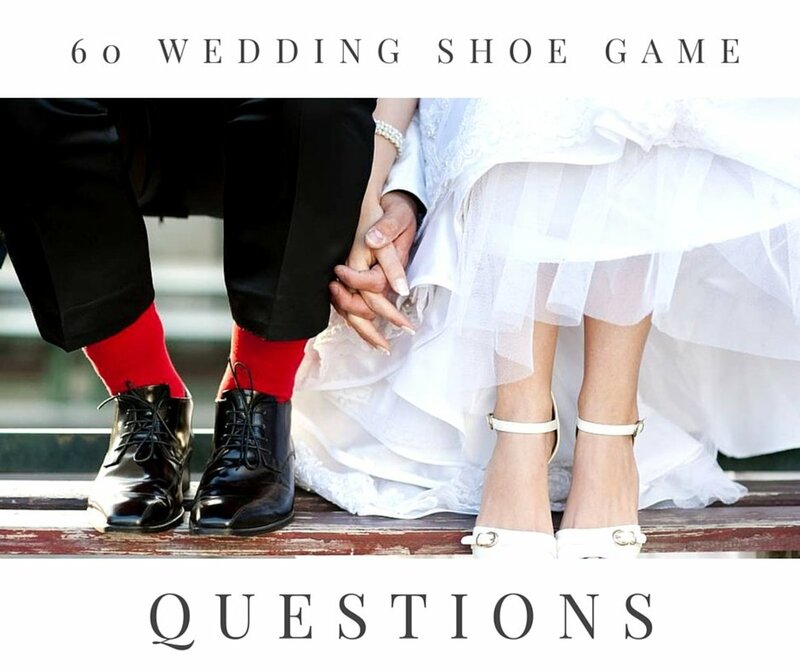 - A bouquet of white flowers and dollar bills should be presented to the bride. The dollar bills are folded and attached in such a way that they should look like the leaves of the flowers. The bride is the center of attention and sits in a central location ready to receive her gifts. 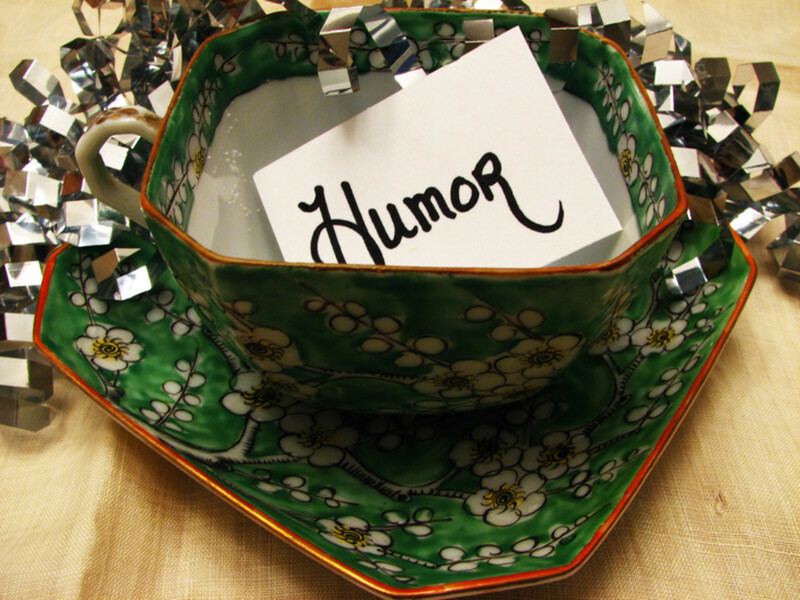 - Each guest is to bring a wrapped teacup and saucer. Presented with them, will be a word, representing characteristics one should have to achieve a happy marriage. Words like: Patience, Cooperation, Music, Unselfishness, Humor, etc... The word should be tucked into the teacup and read aloud as the gift is opened. 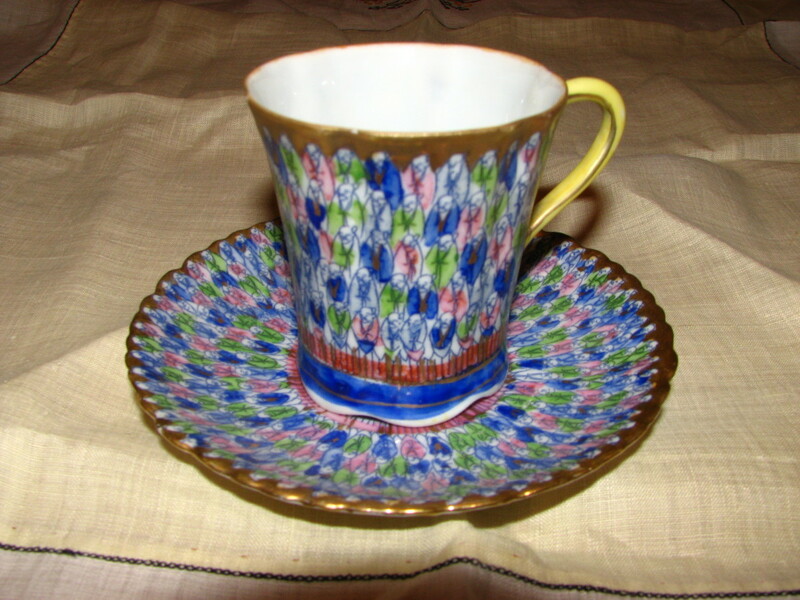 - After the presentation of the teacups, tea is served, while music plays and friends visit. Tell us about your collection. Your most prized teacup. Where you got it. 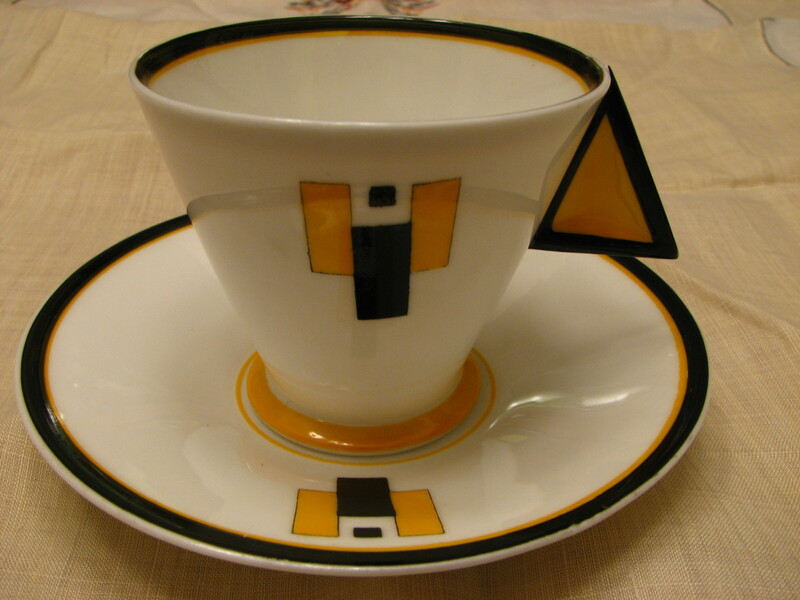 My favorite teacup is the Art Deco one in the introductory photo. It is a rare one from Shelby in England. I admired it for years in my cousin's china cabinet. When she passed away, my dad let me have it, along with many of her other beauties, but that one is my fav! Do You Have a Teacup Collection? I love art deco and some of these pictures made my mouth water. Oh I loved reading about the tradition of a tea cup shower. I will certainly share this with my sister who loves tea cups. I had a friend who had a collection like this. Every time we went shopping, we looked at tea cups. 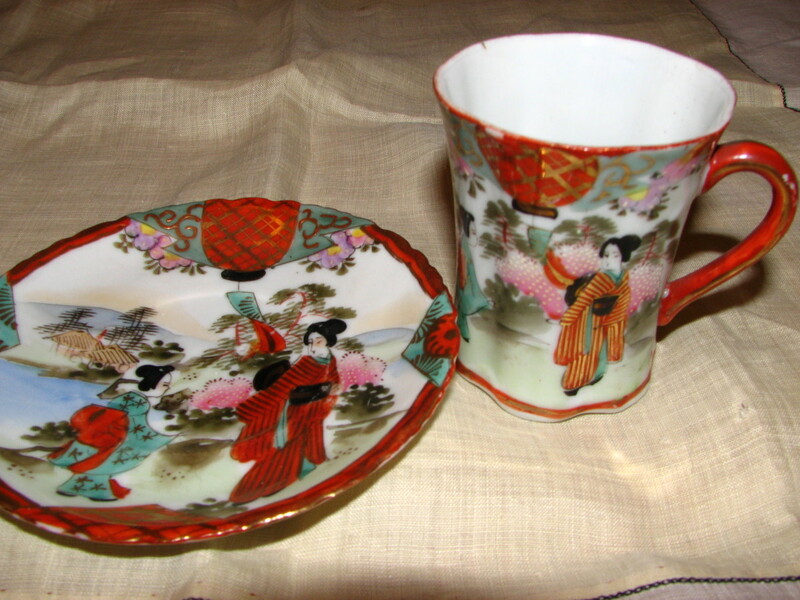 I have some Japanese tea cups that I love. I love your lenses...so interesting. One of my great aunts gave me a tea cup each year for my birthday. The collection remained boxed, sadly, until it was sold for lack of space. I hope the cups went to people like you who are treasuring them! I got my silver cups from Paris and they have served me well. I like the shine though they need special care in cleaning and storage. I do not have a teacup collection but I love this idea!